In this article, A Shade Above – with convenient locations in Charlotte and Cornelius, North Carolina (NC) and North Myrtle Beach, South Carolina (SC) – is here to tell you about amazing drapery alternatives for homes in Charlotte, NC. We proudly offer beautiful shades and blinds from Hunter Douglas. While draperies can be a very beautiful addition to any home creating a grand and more sophisticated feel, draperies often aren’t the best solution for every home. We are here to walk you through a few options that make great alternatives to drapery depending on your needs. Contact A Shade Above today to learn more about some amazing alternatives to drapery for homes in Charlotte, NC and the surrounding area. We have very classic options that creates a timeless look in any home. Hunter Douglas’s Roman Shade collection offers a variety of beautiful options, including the Vignette® Modern Roman Shades, the Solera® Soft Shades, and the Design Studio™ Roman Shades. There is something for everyone in this collection and we are sure to find you something that you like. To further explain, the Vignette® Modern Roman Shades take a modern spin on traditional style roman shades. The Solera® Soft Shades combine traditional roman shades with the newer style of shade called a cellular shade. This combination allows you to get the appearance and beauty of a roman shade with the energy-efficiency of a cellular shade. By trapping air in cells, these shades will insulate your home and help keep your energy bills down. The last option is the Design Studio™ Roman Shade. These shades are your traditional style roman shades and also give you the ability to customize so many different aspects in fabrics as well as lift systems. Next, we offer the Luminette® Privacy Sheers. 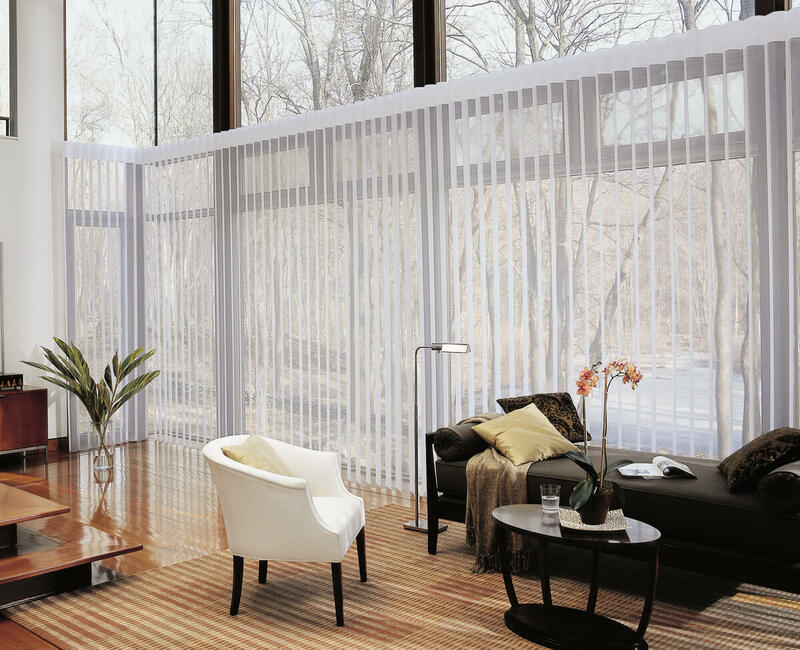 These shades are incredibly versatile and give the illusion of sheer drapery panels. They feature unique vertical vanes that can be turned to adjust the light and privacy in a space. You can rotate them a whole 180 degrees, giving you tons of different options in terms of light and privacy. You will also love the sheer aspect of these shades, because they keep out harsh UV rays that can make your home uncomfortable, while allowing in beautiful natural light. A Shade Above Window Fashions offers a variety of options in all four of our showrooms. We have locations in both Charlotte and Cornelius, North Carolina, as well as North Myrtle Beach, South Carolina, where you can browse samples of our amazing Hunter Douglas products and interact with them. Our incredible team of professionals is committed to helping you find exactly what you are looking for. Because of our various separate locations, we are proud to say we can serve the entire greater Charlotte area and beyond. Give us a call today or stop by and let us know how we can help you!